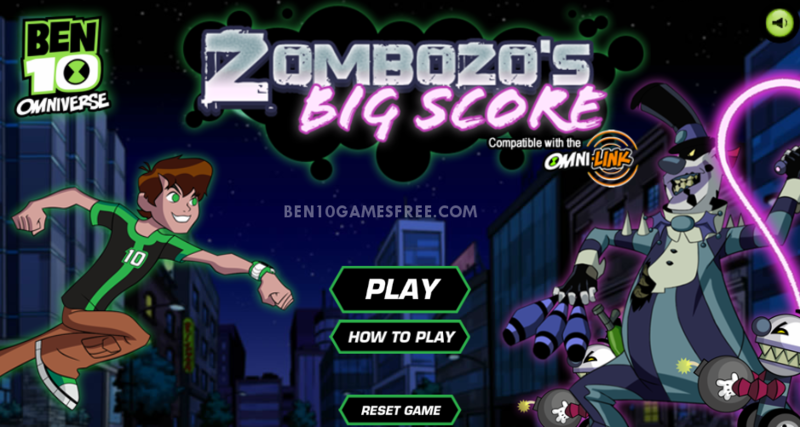 Get along all the Ben 10 fans because we are adding another Awesome Game – Ben 10 Zombozo Big Score. In this game, you have to help Gwen, Ben and Max to defeat the Devil Vilgax who wants to occupy the power of the Omnitrix. In Ben 10 Zombozo Big Score, you have to use the transformative power of Ben’s Omnitrix into any alien to chase down the evil clown Zombozo. Complete all the missions giving to you at the starting of each level successfully without getting hit by the enemy targets. You can upgrade the abilities of Ben’s aliens with the coins you collect in the game. So, don’t forget to collect as many coins you can throughout the game. Start your journey as a Ben and then change into different Aliens as you earn the power through the coins you collect. Run, jump and Attack in this endless runner game to save the city of Bellwood from the evil havoc of the Zombozo. Pro Tip: Don’t forget to use the power of XLR8, Shocksquatch, Crashhopper and Stinkfly to run faster and farther. While running you have to watch out for the Booby taps of the Devil Vilgax. Now, you have enough knowledge to beat down the evil Havoc. Let’s Start Running and once again help Ben to save the world from the Evil Eyes! Don’t Forget to give your rating for Ben 10 Zombozo Big Score game and share your tips and tricks to win this game in the comments section below.